Guess where I’m going tomorrow? 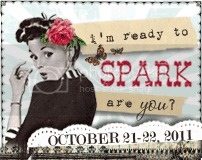 Utah to attend Spark 3, a two-day creative event with industry leading teachers in a beautiful setting and I’m downright giddy. As an organizer of events on a daily basis (birthday parties, PTO events at school….even laundry – which is an EVENT at my house -thank you very much!!) I’m so excited that I’m ATTENDING one. Somebody in Utah is expecting my arrival and I’m told has a schedule of events and a goodie-bag waiting for ME! All I have to do is show-up. Well – I also have to pack and you know me…that hasn’t been done yet. But STILL – how awesome is it to be a participant instead of an organizer every once in a while? Whenever I get ready to travel without my family, I get a little nervous. But I’m ready to meet new friends and have a good time enjoying true fall weather. With excitement and a pair of cowboy boots I think I’ll be ready. The rest…just details! What are you looking forward to doing or going this fall? Sounds like a blast! Have fun! Come back and teach us!!! !